Living in the Shadow of His Hand: People Pleaser! I met a very dear Spirit-filled friend last night at the football game. She’s the kind of woman that anyone would be honored to know. She knows the Bible from cover to cover, walks close to God, raises her family in respect and fear of God, and has planned her entire life around Him. She even does all her cooking for the week on Saturday so that she can spend two hours each night with her husband and children in family prayer time. Is she a powerful woman of faith? You bet! Last night we had the pleasure of sitting at the game and just talking about the various things we had been going through with God, scriptures, His love, and so forth. It was a conversation like two friends speaking of a mutual friend. So when she asked me to pray with her before she left, I was more than willing! We were like two teens talking together on the phone and deciding to add a third friend to the line. I walked her out to meet her husband for a ride home, and there in the entrance of the football field with no one around we held hands to pray. But I’d forgotten how she prays! She prays boldly, loudly, and she prays until the Spirit in her says she’s done. Nothing interrupts the conversation with God that she has, and rightly so! There holding hands, heads bowed, eyes closed, praying together was sweet…until people started passing by. That’s when a spirit of fear can against me, and I stopped praying and the little voice in my head took over. “I hear people passing by. Do they know me? What will these people think? They all know me. They’ll think we’re crazed lunatics standing here praying loud, and heads bowed. By now some of them have passed by twice! I’m going to be the rumor of the town! Say Amen! Say Amen!!! Is that the band passing by? OH MY GOODNESS! The entire band is passing by! SAY AMEN!! !” After about 15 minutes or so, she did say Amen, and I felt such relief. And immediately God spoke to my heart about how I felt and I had no answers except “I’m sorry God”. As much as I enjoyed praying with her, I let the fear of what others think enter in. I became a people pleaser, wondering what they all were thinking, wishing I could please them, and to make it even worse – it was while I was praying to My God! I have to admit, I was pretty ticked off at myself for falling into that trap! Especially after what I’d taught the youth of our church Wednesday night. This past Wednesday night we talked about having courage. I gave two examples, Group “P” and Group “G”. Group “P” is the group you are a part of when you want to please people. But the problem with that is the people come and go, and the things it takes to please each one change from day to day. And some of them simply will never be pleased in you. But Group “G” is for those that desire to please God. He is a single audience, always there and never changing. And He has given us His unchanging word to instruct us in how to please Him. 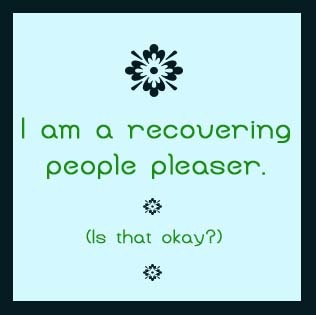 It is simply easier to please God than try to be a people pleaser. So there you have it, my humbling before God on a platter! And God even warned me that this trial was coming and yet, I didn’t take the warning personally. Yesterday my husband Don brought me a verse to read on his phone. That verse was Isaiah 2:22 “Stop regarding man in whose nostrils is breath, for of what account is he?” Thank you Lord, for correction when I need it, because I know you reserve that for your children whom you love.